Winter moth outbreaks and defoliation was first noticed in Massachusetts on Cape Anne on the North Shore, and near Cohasset, Hingham, and Rockland on the South Shore in the late 1990s. At the time, they were assumed to be a caused by a native species, such as fall cankerworm. However, the persistence of the outbreak over several years, and the observation of adult flight occurring at the end of December suggested something different, possibly winter moth, a species native to Europe, which gets its name because adult males of the species fly in the wintertime. The identification of this species as winter moth, Operophtera brumata L, was confirmed by David Wagner at the University of Connecticut and Richard Hoebeke at Cornell University in 2003. Over the next decade, defoliation by winter moth spread over all of the North Shore into the western suburbs of Boston and across the South Shore onto Cape Cod and Martha’s Vineyard and into Rhode Island (Elkinton et al 2014). The larval winter moths (caterpillars) defoliate a very large range of deciduous trees, including maples, oaks and apples. In 2005-2007, Dr. Joseph Elkinton at the University of Massachusetts, Amherst led a survey effort based on pheromone- baited traps that delineated the distribution of winter moths in the northeastern United States and adjacent areas of Canada (Fig. 1A), Elkinton et al 2010, 2015). It extended from eastern Long Island and southeast Connecticut, across Rhode Island, eastern Massachusetts and coastal regions of New Hampshire and Maine north to Nova Scotia. 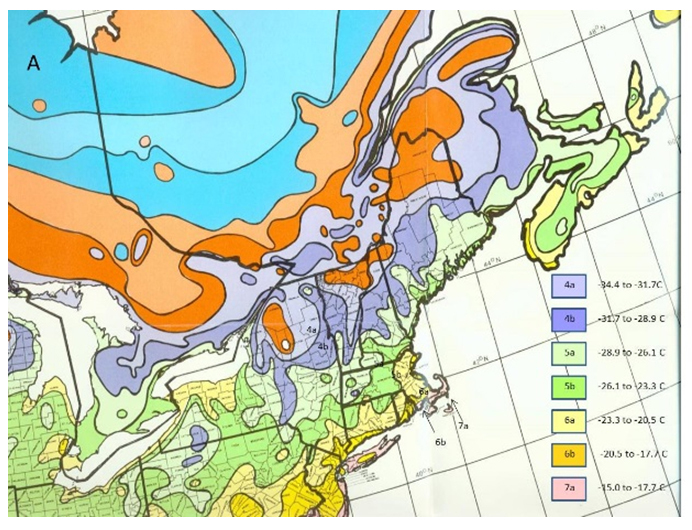 The distribution matches very closely to warmer winter temperatures illustrated by the USDA cold hardiness zone maps (Fig. 1B). The pheromone traps also captured Bruce spanworm, Operophtera bruceata, a native species that is a very close relative of winter moth, because both species utilize the same pheromone to attract mates. In contrast to winter moth, Bruce spanworm occurs everywhere across the northern states in the US and adjacent areas of Canada. It is almost never an outbreak species, although like winter moth it feeds on a very wide range of host trees. The factors that limit winter moth to coastal regions and the reasons why Bruce spanworm is not an outbreak species are currently under research in Elkinton’s laboratory at UMass, especially by his graduate student Hannah Broadley. Elkinton and his colleagues have also conducted a yearly east-west survey with pheromone traps along Route 2 in central Massachusetts beginning in 2007. They documented the spread of winter moth into the central part of Massachusetts, as far west as Athol (Elkinton et al 2014, 2015). Defoliation by winter moth, however, has remained confined to the eastern third of the state. Possibly the same winter temperatures that apparently limit winter moth to coastal regions in Maine, prevent winter moth from achieving outbreak densities in central Massachusetts. Again, this is a matter currently under research in Elkinton’s laboratory. In 2012, for the first time, winter moth populations erupted into outbreak levels along the coast of Maine (Elkinton et al. 2015). Very likely, this event was linked to global climate change. The native range of winter moth extends from Europe to the Russian Far East. For the most part, it is not a serious defoliator in Europe because a wide range of natural enemies, including predators and parasitoids, keep it in check; although it is a fairly abundant caterpillar and has been the subject of a fair amount of research by European investigators. In recent decades, outbreak populations of winter moth have occurred in northern Norway, Sweden and Finland. It has been moving to new areas of these countries, where it was formerly precluded by cold winter temperatures, again because of global climate change. Winter moth has been introduced several times to North America prior to the recent outbreak in New England. It came into Nova Scotia in the 1930s, Oregon in the 1950s and western British Columbia near Vancouver in the 1970s. In each of those locations, a major biological control effort was mounted based on the introduction of two European parasitoids, Cyzenis albicans, a tachinid fly, and Agrypon flaveolatum, a parasitic wasp in the family Ichneumonidae. These parasitoids, especially C. albicans, became established and converted winter moth into a low-density, non-outbreak species, beginning in 1961 in Nova Scotia and in the late 1970s, on Vancouver Island. This project was one of the most famous biological control successes targeting any species of forest insects anywhere in the world. It was obvious that we should try the same thing in New England. Cyzenis albicans was the obvious choice, because it is very specialized. It attacks only winter moth, possibly Bruce spanworm, but not other lepidopteran caterpillars, including other inchworms. Agrypon flaveolatum, on the other hand, was taxonomically uncertain. It appeared to be a generalist, attacking many species of Lepidoptera (the butterflies and moths), deeming it unacceptable as a candidate for biological control introduction in the modern era, when impacts on other insect species is an important consideration. This was important because Massachusetts has more than a dozen rare species of geometrid caterpillars. Dr. Elkinton and his laboratory colleagues initiated biological control introductions of C. albicans beginning with a release of 235 adult flies in Hingham, Massachusetts in May 2005. They had collected the flies by collecting the parasitized winter moth caterpillars in Canada, one year before the release. At first, they attempted to make collections in Nova Scotia, but densities of winter moth were too low to collect enough caterpillars to make the project feasible. Luckily, with the help of colleagues of the Canadian Forest Service, they discovered that densities of winter moth in Victoria on Vancouver Island, British Columbia were considerably higher, even though they too were largely controlled by the introduction of C. albicans in the 1970s. Every year since that time, George Boettner of the Elkinton lab has managed a crew in Victoria, BC and they collected tens of thousands winter moth caterpillars, about half of which contained larvae of C. albicans. The caterpillars were then reared to the pupal stage and the immature flies pupated inside the winter moth pupae in early summer. The pupae were shipped to the USDA quarantine facility on Cape Cod, where they were held in growth chambers over the winter. The pupae were warmed up in the spring and the adult flies emerged, were set up in cages to allow mating, and finally Elkinton and his colleagues released them at carefully selected sites throughout eastern New England. In the first few years, only one or two release sites were chosen, but more recently as many as seven to ten new sites were chosen each year as the number of immature flies collected for release increased. It was important to limit the number of release sites each year, so that a minimum of 1600-2000 flies could be released at each site. Releasing fewer flies would run the risk that following dispersal of the released individuals, they would emerge the following year and be too sparse to find mates and thereby go extinct in the location. This is a common challenge shared by all such biological control projects. Since 2015, after C. albicans became abundant in Wellesley, MA and surrounding communities, Elkinton and his colleagues shifted their collecting activities to that location. It was obviously much less expensive to collect locally in New England and the flies collected have been selected (as evidenced by surviving locally) to persist in New England’s harsher climatic conditions, which differ very much from those that occur on Vancouver Island. The project has been made possible thanks to funding from the USDA Forest Service, USDA Animal and Plant Health Inspection Service, and earlier support from the Commonwealth of Massachusetts and the Mass. Department of Conservation and Recreation. As of 2016, Elkinton and his colleagues have released the flies at 41 locations from southeast Connecticut to coastal Maine (Fig. 2). They have recovered flies the following years at 21 of those locations indicated by the fly symbol in Fig. 2, thus demonstrating that the flies have become established. It has often taken several years at each site to recover any flies following release, much as it did in Nova Scotia in the 1950s. The reason is that the fly, like winter moth, has but one generation a year. It takes several years for the 1600-2000 released flies to survive and reproduce sufficiently in a population that consists of something close to 10 million winter moth larvae per acre (100,000 larvae per tree is common) to enable recovery of any parasitized larvae at all in the collection of 100-500 winter moth larvae. (Collections are made by Elkinton and his colleagues at each of the 41 release sites each year.) They have recovered flies at all 17 of the sites that were released prior to 2012, so they are confident that all, or nearly all, of the 41 release sites will soon have recovered (established) flies. The biggest success so far has been in the vicinity of Wellesley, MA. Flies were first released there in 2008 and first recovered in 2010. Since that time, levels of parasitism by C. albicans have reached 20-50%, much as they did in Nova Scotia and on Vancouver Island several decades ago. Elkinton and his colleagues have further demonstrated the spread of C. albicans along transects extending 6 miles from Wellesley in six different directions into surrounding towns. It is clear that C. albicans will soon be widely distributed across eastern Massachusetts and in surrounding states, wherever outbreak populations of winter moth exist. Merely establishing C. albicans does not necessarily mean that it will control winter moth densities, even if it did so in Canada as described above. Elkinton and his colleagues have maintained research plots all across eastern Massachusetts since 2004 where they take multiple measures of winter moth density and defoliation, so they could document the impact of C. albicans on winter moth, once it became established. The data from Wellesley look very promising in this regard. Densities of winter moth and levels of defoliation in Wellesley have declined consistently over the last five years, compared to what they were before Cyzenis albicans was established. Research in Canada suggested that once C. albicans brings the densities of winter moth down to a lower level, other sources of mortality, particularly predators (small mammals such as shrews, rove beetles, carabid beetles, and a native wasp) that attack winter moth pupae in the soil over the summer months play a critical role in helping maintain these lower densities. Research led by graduate student Hannah Broadley in Elkinton’s lab is documenting the impact of these predators in Wellesley and at other sites. In summary, Cyzenis albicans is starting to take off at many sites in eastern New England so it looks very much as though Elkinton and his colleagues are on track to repeat the earlier biological control successes with C. albicans in Canada. Chemical management techniques employed for winter moth should also seek to preserve biological control agents such as Cyzenis albicans in these areas. Management should focus on killing eggs (dormant oil sprays) where practical (such as in blueberry crops or very small landscape plants) or limit sprays to biorationals such that can target early instar (younger) caterpillars where possible, to prevent killing C. albicans larva in the later instar (older) caterpillars and pupae. Cyzenis albicans is not available per request at this time. The Elkinton lab is working to establish this biocontrol agent in the above mentioned sites, as well as others, with the intent that the flies will (over time) naturally disperse throughout surrounding areas also suffering from winter moth defoliation. In memory of Robert Childs, UMass Extension, who helped solve the mystery of this early spring defoliator. Elkinton, J., A. Liebhold, G. Boettner and M. Sremac. 2014. Invasion spread of Operophtera brumata in northeastern United States and hybridization with O. bruceata Biological Invasions 16: 2263-2272. Elkinton, J., G. Boettner, A. Liebhold and R. Gwiazdowski. 2015. Biology, spread and biological control of winter moth in the eastern United States. USDA Forest Service, FHTET-2014-07. Written by: Joseph Elkinton, Professor of Environmental Conservation at UMass Amherst, George Boettner, Lab Manager in the Dept. of Environmental Conservation at UMass Amherst, Tawny Simisky, Extension Entomologist, UMass Extension Landscape, Nursery, & Urban Forestry Program and Deborah Swanson, Horticulturist, UMass Extension/Plymouth County Extension (retired).